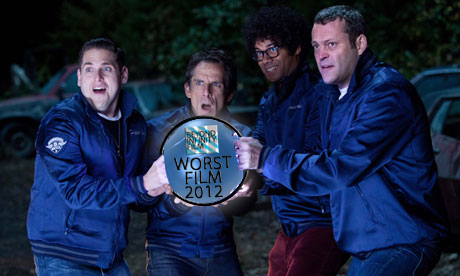 Beyond Infinity Film: 2012's Cinema Nightmares! Daniel Radcliffe's first big screen project since the end of the gargantuan Harry Potter franchise set the actor his biggest challenge yet; shaking off the weight of the franchise that made his name and to break away from it before becoming stereotyped into the part. So did he do it? No, of course not. I know this may sound like I'm just bullying Radcliffe by badmouthing his career, yet it is this performance that drags down what could have been a special horror film that opted for a more traditional style instead of the tiring Paranormal Activity and Saw films that have plagued the cinema in recent years. Not only did I never believe that the young actor was a widowed father and a successful lawyer, the big problem was that I never saw a character at all, just a performance - or rather an attempt at one. Failing to get behind the lead character meant that the film failed to get an emotional response from me, making The Woman in Black lose all sense of peril and credibility as a result. Click here to read the full review. I've actually been a strong defender of John Carter, making it known that I believe that the film is no-where near as bad as all of the negative press surrounding it made it out to be - there are far worse films out there that deserve such bad publicity a lot more. In fact John Carter was actually a rather interesting film in context, just as long as you consider the fact that it is adapted from a book published in 1917, then you can see how it was such a strong source of inspiration for most science fiction pieces since, including the likes of Star Wars and Avatar. Yet the film certainly isn't perfect - the performances and storytelling aren't groundbreaking, and I often find the heavy use of CGI somewhat off-putting - but it certainly isn't the worst film released this year... Click here to read the full review. Despite Meryl Streep's much deserved award winning performance, The Iron Lady was a film that didn't quite get it all right. Whilst the scenes set in the past were engaging and well done, the constant jumps back to the present day Thatcher became a nuisance to me, destroying the flow and the entertainment of the whole film in order to attempt an emotional punch, which I hardly felt as a result. Had the film opted for a simpler narrative looking at Thatcher's incredible historic story - rather than focussing so much on the rather controversial and uncomfortable themes of the dementia of a woman who is still alive and suffering today - the film would have been a much better product as a result. Click here to read the full review. This one might turn a few heads as Seth MacFarlane's Ted was one of the most popular films of the Summer for a lot of people, but I really didn't think it was all that it is cracked up to be. A new film by the creator of hit TV show Family Guy promised a fresh new inventive comedy, but failed to deliver - there was nothing new or interesting about the film at all. That's not the problem though, the problem is that bar a few moments of great humour, the film wasn't even that funny, which was not helped either by the completely predictable and unengaging plot, and the two-dimensional characters that I just didn't care about at all. The gag is that the teddy bear is alive, and is grown up so swears, does drugs and drinks, etc; the problem is that the joke lasts for 105 minutes longer than it needs to (and yes, the running time was 106 minutes long). In all honesty Ted bored me more than it entertained me, which is a real shame because someone like MacFarlane has got the talent to create something a lot better than this. Click here to read the full review. What could have been a wonderful family film adaptation of a book from the genius of Dr. Suess in fact turned out to miss the demographic by a long shot, featuring a ton of entertainment for anyone under five, and very little for anyone else. It is commendable for trying to push its environmental message to the young audience; I just wish that it did it a little more subtly rather than clubbing me around the head with it for the duration of the running time. The songs were pretty fun though. Click here to read the full review. Just as many people loved Ted, a lot of critics seemed to go wild for the Charlize Theron starring film Young Adult. Yet there is a lot that is fundamentally wrong with the film. Theron's character, an adult still acting as if she's in her teens, is entirely unlikable and although it is arguable that she is not meant to be, the point still stands that I just cannot sympathise with her; especially when the film goes no-where by the end of it! There is no character development, nor any conclusion to her story, by the film's climax she simply fails in her warped plan, sleeps with someone for pity and then uses those who she continues to look down upon for an ego-boost, before going back to what she was doing at the start. Completely anti-climatic and not nearly as funny or clever as it thinks it is, Young Adult is not as good as some critics make it out to be. While the original was fun, The Expendable 2 is mostly anything but. Tedious, loud, and void of any plot or characters, the explosive sequel goes bigger, but by no means better. Whilst it is redeemed slightly by the big finale which manages to hit the nail on the head and provide the tongue in cheek action fun promised by the packed cast, it is not worth watching the previous hour and a half of the film that takes itself far too seriously to get there. Click here to read the full review. If John Carter and The Expendables 2 had a baby, it might look like Wrath of the Titans. Soulless and even more two dimensional than the film's 3D effects, watching Wrath of the Titans is about as much fun as smashing your own face in with a large rock. A lot of the expensive CGI-heavy budget is put towards creating not a lot of action at all, as nothing really actually happens in the film. Even the great Liam Neeson spends his time in the film standing there and doing nothing, literally! To think that the film features two of the leading actors from Schindler's List and completely wastes them says an awful lot about this awful film. Whilst Clash of the Titans infamously featured no Titans clashing, this sequel does feature a Titan, but nothing in the way of any wrath, nor enjoyment, excitement or entertainment. Click here to read the full review. Tom Hardy is a very talented actor, and has starred in two fantastic films this year in two fantastic, menacing, brilliant roles. These films are The Dark Knight Rises and Lawless, because unfortunately even someone as great as Hardy couldn't save the abysmal This Means War. I don't even know where to begin, the film is just stupid. Two spies using their tech and skill to spy on a girl that they are both seeing, and to sabotage each other's dates with her, whilst at the same time the evil villain that they are meant to be stopping is completely forgotten about just like that - ya know, 'cause this is way more important! It's a film that tells people that it's alright to cheat on others and go behind their backs. Formulaic, unfunny, bland, tedious, irritating and terribly cynical, the feeling that you get when watching this film is not unlike the vile after-taste of vomit at the back of your throat. Tom Hardy can do better films than this, and judging by the expression void of any enthusiasm that he shows throughout the film, he knows it too. I love film. I think that's pretty clear to everyone who knows me or reads this blog. I can't get enough of film, so much so that I'm currently dedicating my life to it. But on a very rare occasion I do have wonder why, especially if I see a film so repugnant and horrible as The Watch. I can't remember ever walking out of a film that was genuinely so bad that it actually gave me a headache! It's ridiculous, stupid, vulgar and not even slightly funny or enjoyable at all. I sat in a screening full of teenagers (who the film is targeting) and I don't remember the film getting a single laugh from anyone. The cast are irritating beyond belief; Ben Stiller is void of humour as the straight man, Vince Vaughn is one of the most unbearable screen presences in film, the recently Oscar nominated Jonah Hill plays an imitation of Zach Galifianakis in The Hangover (and seemingly every other one of his films), and the talents of Richard Ayoade are completely wasted as he gets pushed to the back. This film is a soulless, money grabbing machine designed only to take the money out of your pocket rather than to entertain even slightly - I guarantee that no-one making The Watch thought that it was a good idea, and no-one involved will be proud of it. A film so horrifyingly bad that, The Watch made me so angry that I almost lost faith in film - avoid it like the plague, even if you have to catch the plague to avoid it! Click here to read the full review. So there it is, my 10 least favourite films of the 2012, but what were yours? Perhaps some of your favourites are even in my list? Leave your thoughts and lists in the comments section below, as always I'd love to hear what you think. Oh, and Happy New Year everyone - let's hope that 2013 doesn't have many films as bad as these!